NTU and Frontmaterials Corp Ltd. results on transparent perovskite solar cell, 2017-2018. In the first year of MERA, we have accomplished many different work in the field of perovskite photovoltaic successfully. First, to let perovskite tandem with other system, we tune the band gap of perovskite materials from 1.60 to 1.81 eV by bromide doping. The absorption and photoluminescence spectra are shown in the Figure 1. 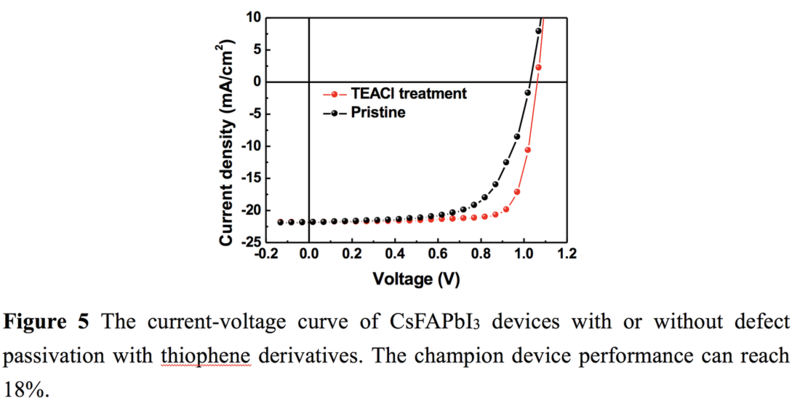 Besides, with the addition of potassium ion into the perovskite thin film, we reduced the open-circuit voltage(Voc) loss for high bandgap perovskite solar cell and fabricated device with champion efficiency of 15.4%. The corresponding current-voltage curve is shown in Figure 2. Another key issue of making tandem devices is the needs of high quality transparent electrode, by carefully controlling the oxygen flow rate during sputtering process, we obtained high quality ITO transparent electrode with average transmission 77% in visible light and sheet resistance lower than 37 ohm/sqr. Figure 3shows the transmittance spectrum and sheet resistance of ITO thin film with different thickness. 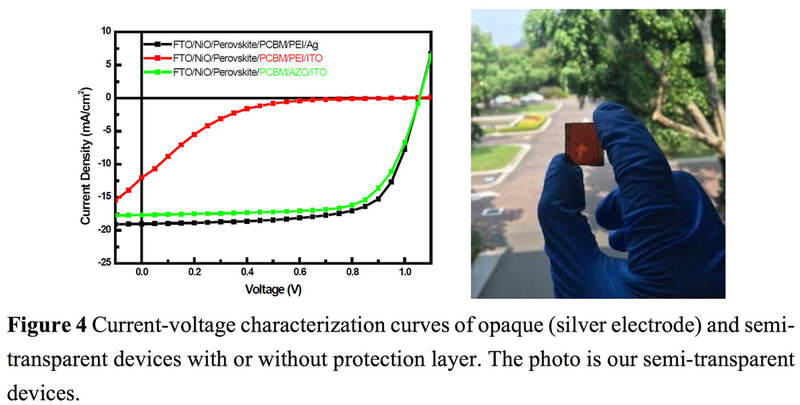 After the help of AZO as protection layer, semi-transparent perovskite photovoltaics with power conversion efficiency over 13% were achieved. The photograph of our semi-transparent device and its corresponding current-voltage curve and characteristic performance are shown in Figure 4and Table 1 respectively. Third, we developed an encapsulation material suitable for perovskite solar cells, showing water permeability < 10-3g/m 24 hrs under 50oC/95RH%. The encapsulated devices exhibit excellent stability under damp heat test (85oC/85% RH) over 225 hours with efficiency loss less than 10%. The results are demonstrated in Figure 6. ​Forth, we cooperated with E-sun Co Ltd. and Prof. Huang from Department of mechanical engineering of National Taiwan University to establish 40cm x 40cm large area slot-die coating machine. 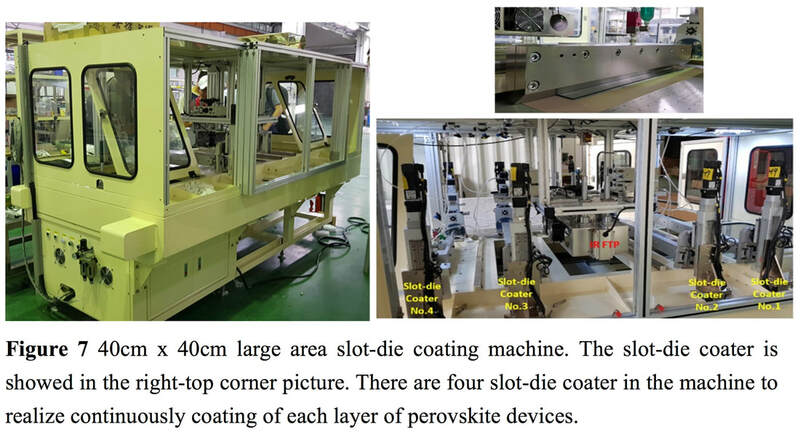 The photos of machine are shown in Figure 7.The highest efficiency of perovskite devices with peovskite layer made through slot-die coating using gamma-butyrolacton(GBL) and dimethylsulfoxide(DMSO) cosolvent system and PEG additive achieved 13.61% in ambient. The corresponding data of devices with PEG additive are shown in Table 2. Besides, by using NIR heating process, 8 cm x 8 cm of uniform perovskite film has been fabricated with the solar cell efficiency of 14.3%. The photograph of 8 cm x 8 cm perovskite thin film and the performance of devices made from 8 cm x 8 cm perovskite film are shown in Figure 8and Table 3 respectively.